At the University of Iowa’s Voxman Music Building, LMN Architects was challenged with creating the ultimate listening experience. When drawing up the building’s design designers knew that it would be difficult for acoustical engineers to engender and manipulate sound in a space with high vaulted ceilings. They figured that in order to help provide the best acoustics in the room, a rigid and lightweight material would be needed to hang in the open space. 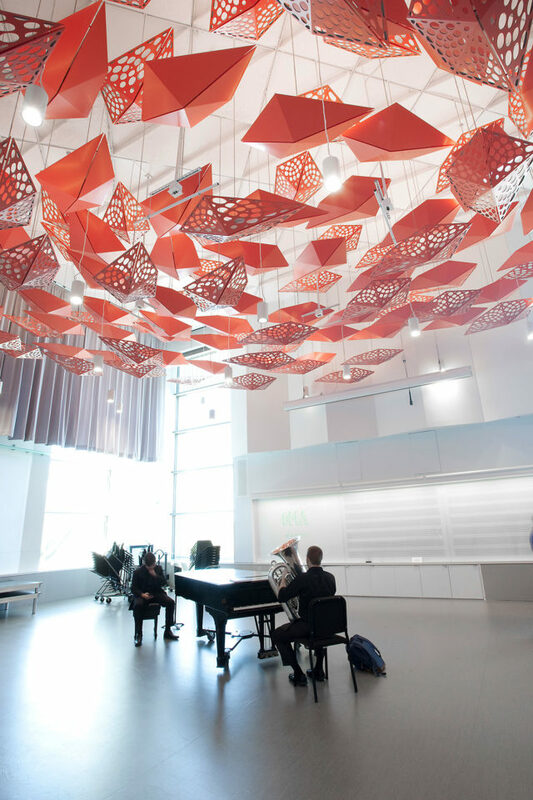 This material would not just contribute to the acoustics but it would also add a bold yet elegant aesthetic to the music building. 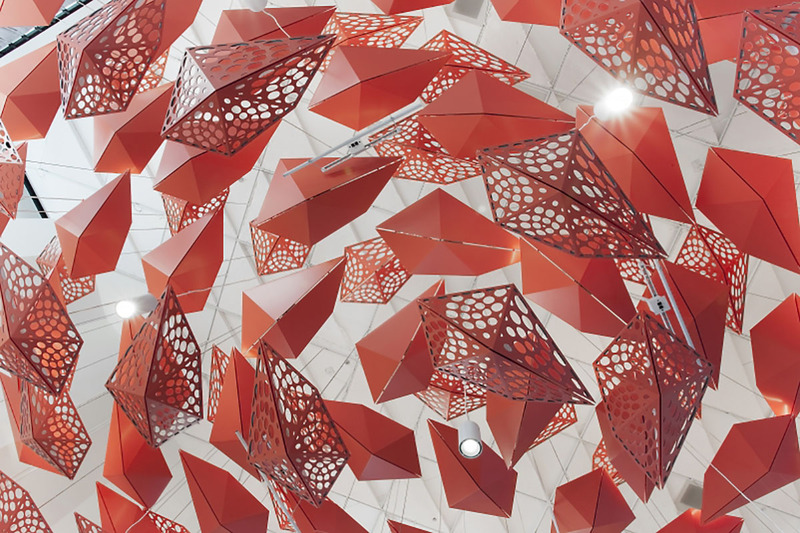 The solution was found in 36,000 square-feet of 6mm-thick ALPOLIC/fr Metal Composite Material (MCM), which was cleverly fabricated into colorful kites by Shaffner Heaney Associates, Inc. Bright hordes of MCM kites were hung from the ceilings, addressing all engineering concerns while contributing a unique aesthetic element to the Voxman Music Building. During the process of designing the kites to properly aid in sound manipulation, the LMN Tech Studio utilized a 3D parametric model to help determine the best arrangement, resulting in a setting in which aspiring musicians can achieve the best acoustic effects. Six different colors were used among the MCM kites, all of which employed Lumiflon FEVE resin technology. Lumiflon FEVE resin provides a plethora of benefits to any architectural surface, ranging from superior durability to excellent color and gloss retention. These high-performance coatings protect surfaces from UV radiation, water, salt and other elemental factors that would compromise the structural integrity of a coating system, leading to chalking or fading. With Lumiflon FEVE resin, the Voxman Music Building’s colorful kites will remain in pristine condition for many years to come.